Home Notoriously Morbid Shiro Swatches Swatch Post: Shiro Greens! I have to admit: I own an obscene amount of eyeshadows from Shiro Cosmetics. Shiro was my gateway brand into indie makeup and after receiving my first order, I knew I was never going back to mainstream brands for shadows. Shiro is one of the more well-known indie companies, offering collections based on popular fandoms such as Game of Thrones, Avengers, and Pokemon. 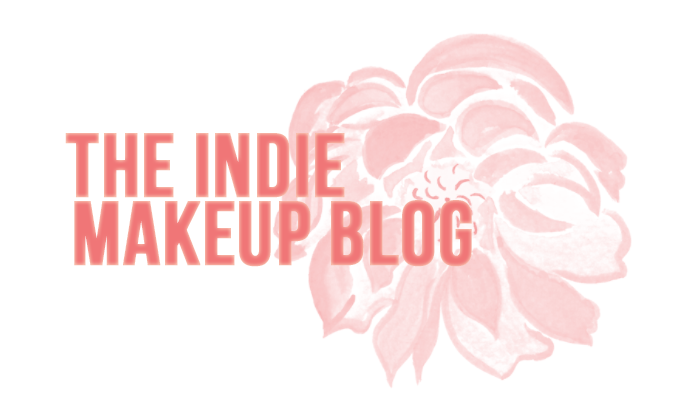 Shiro is often recommended for indie beginners because they have a wide selection of shades and products, an easy to navigate website, and generous samples for only a dollar. They offer a variety of other products too, including lip balms, blushes, face powders, and custom lipglosses. 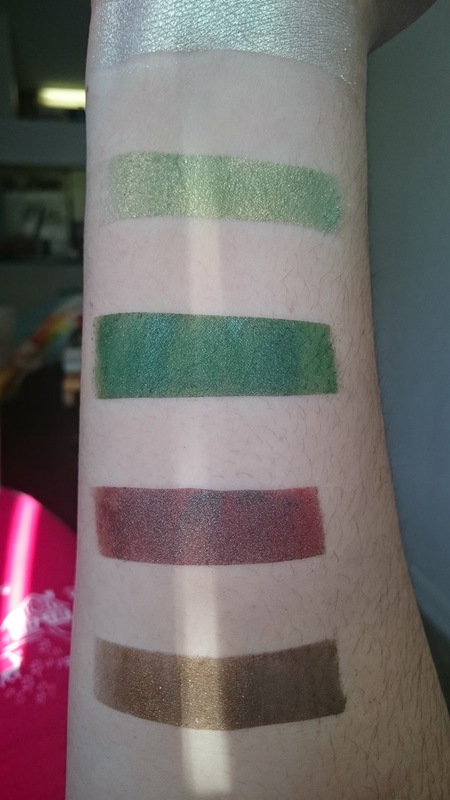 Today I have some swatches of my favorite green shades or shades with green shifts from Shiro. There is also one shade from Notoriously Morbid that I threw in here as well. I will probably be changing up the way in which I do my swatches next time around, I just wanted to get these up. Swatches are over Urban Decay Primer Potion and Darling Girl's Glitter Glue. From top to bottom in outdoor light: Shiro Moon Prism Powder, Notoriously Morbid Stripper Zombie, Shiro Hero of Ages, Shiro Last Homely House, Shiro You Dropped Your Rod. YDYR came out looking a bit patchy here, but it applies just fine on the eyes. From top to bottom in outdoor light: Shiro Moon Prism Powder, Notoriously Morbid Stripper Zombie, Shiro Hero of Ages, Shiro Last Homely House, Shiro You Dropped Your Rod. 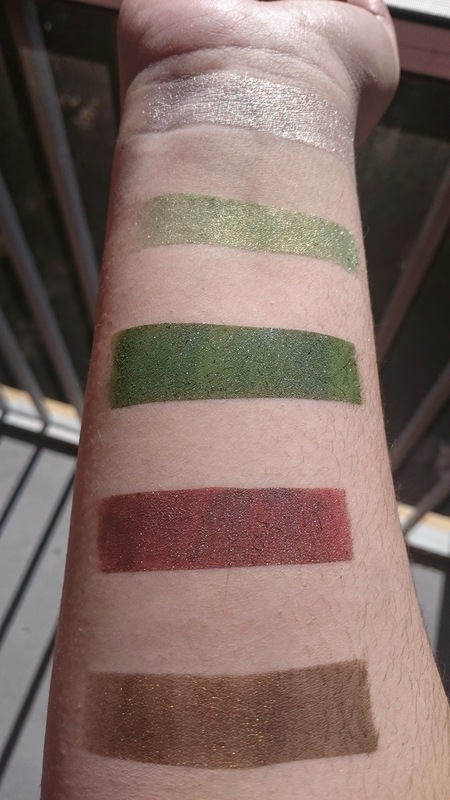 From top to bottom in natural light: Shiro Moon Prism Powder, Notoriously Morbid Stripper Zombie, Shiro Hero of Ages, Shiro Last Homely House, Shiro You Dropped Your Rod. 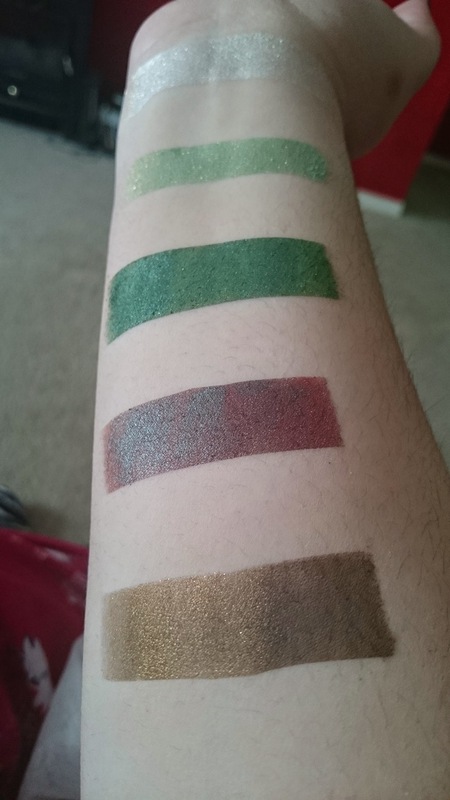 Moon Prism Power isn't showing it here but it has quite an intense green duochrome. Stripper Zombie is a light green with gold shimmer. Hero of Ages is a midtone forest green. Last Homely House is a reddish brown base with a dark green shift. You Dropped Your Rod is a dark brown with a tarnished gold duochrome shift. This one isn't actually green but I included it in here because it pairs great with other green shadows. I usually like to use Moon Prism Power as a highlight/inner corner shade to brighten any green look. Last Homely House can be tricky for me to pull off because it can either look very grungey or just make me look ill. I tend to try to pair it with cooler shades so it doesn't overwhelm my complexion!